Though Bohol suffered heavy damages after a strong earthquake in 2013, with many beautiful old churches reduced to million pieces, it did not close its doors to visitors. It’s still a perfect destination for romantic holidays, family vacations or even solo travel. Here are reasons why you should consider Bohol for your next weekend escape. 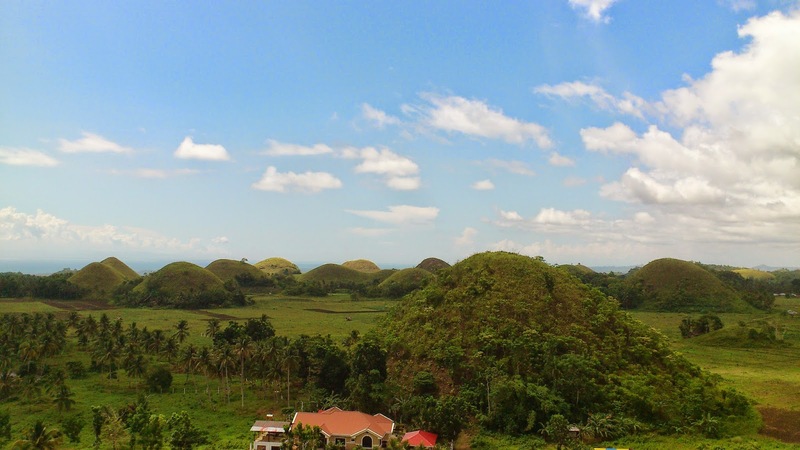 You’ve never been to Bohol if you don’t have a postcard-perfect shot of the Chocolate Hills. During summer, they turn into a pretty shade of brown (hence, the hills earned the name) while during cool season, the hills are covered in lush green. And no, they are not edible. Some hills were damaged during the 2013 earthquake but its beauty still remains. Who says that rice terraces can only be found in Banaue? 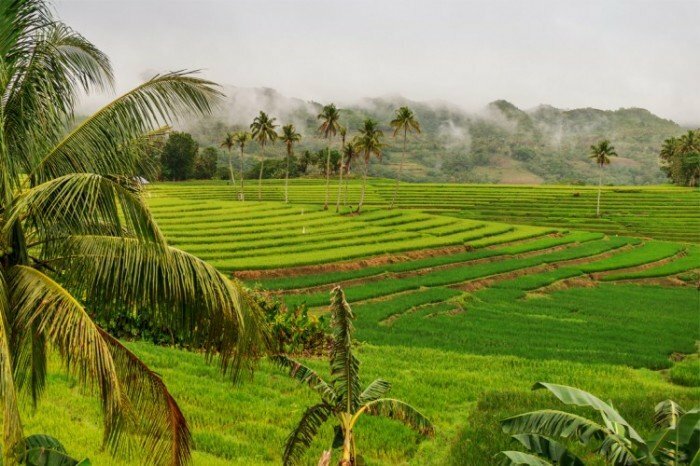 Though not as grandiose as that of the Cordillera region, Bohol’s Cadapdapan Rice Terraces is still a wonderful sight to behold! 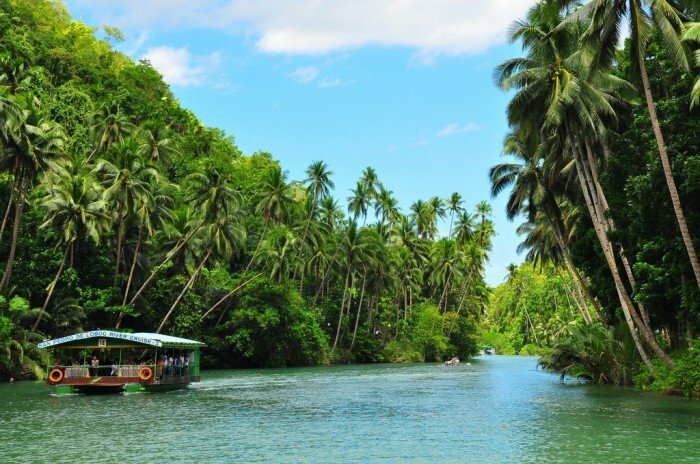 Enjoy your lunch as you cruise over the emerald green expanse of the Loboc River. You get to admire nature’s beauty as performers serenade you with songs and dance numbers. 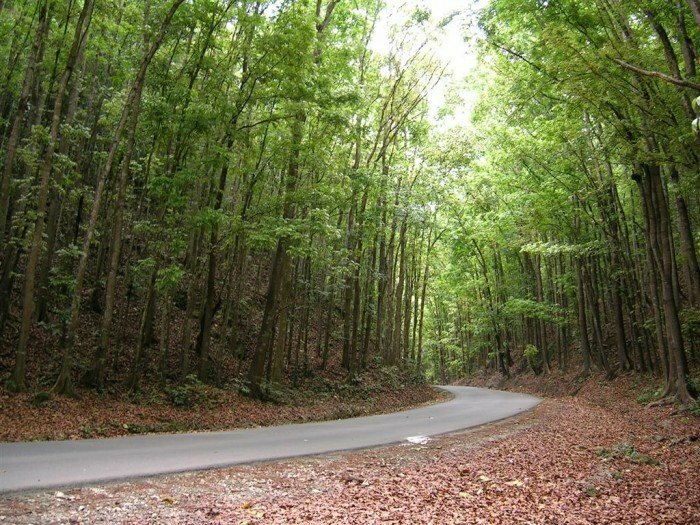 Bohol’s Bilar man-made forest is a two-kilometre stretch of Mahogany trees of the same height, thickness and spread of its branches. Thanks to Philippines being an archipelago, most islands have its own white sand beaches, especially in the Visayas region. Bohol is not an exemption. There’s the long stretch of Alona Beach in Panglao which is a mecca for beach lovers; and Balicasag and Virgin Islands offer an amazing view of marine life. Yes, you can visit Bohol any time of the year for some beach time. In 1565, Miguel López de Legazpi’s ships encountered high winds and were brought to the island of Bohol. To avoid ending the same fate as Ferdinand Magellan, he made friends with the natives telling them that they had come to the island to trade. 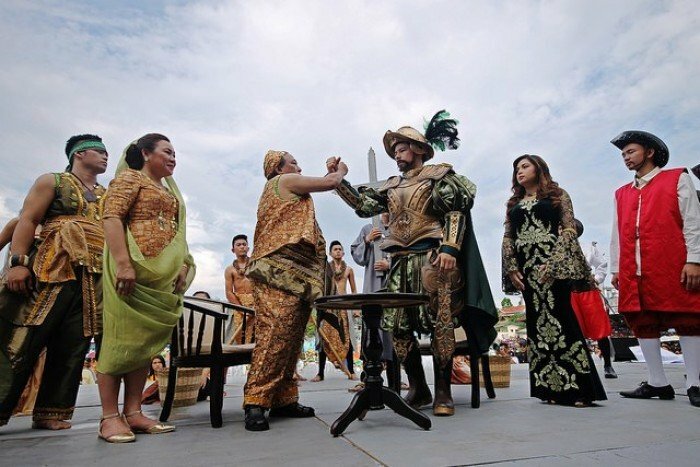 A Sandugo or blood compact was performed between the Spanish explorer and Datu Sikatuna to seal their friendship as part of the tribal tradition. The ceremony was the first treaty of friendship between the Spaniards and Filipinos. “Sandugo” is the Visayan term for “one blood”. Each leader made a small cut on their arm, drew two or three drops of blood from their own arms and mixed it with wine. The mixture must be equally divided between two cups and each leader must drain the cup containing the blood of the other. 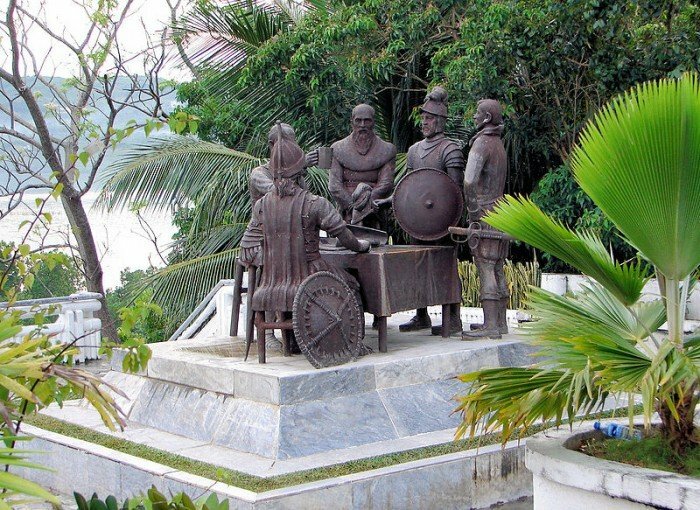 History buffs will be happy to visit the blood compact shrine in Tagbilaran City. A yearly festival, Sandugo, honours the celebration of the blood compact every March. 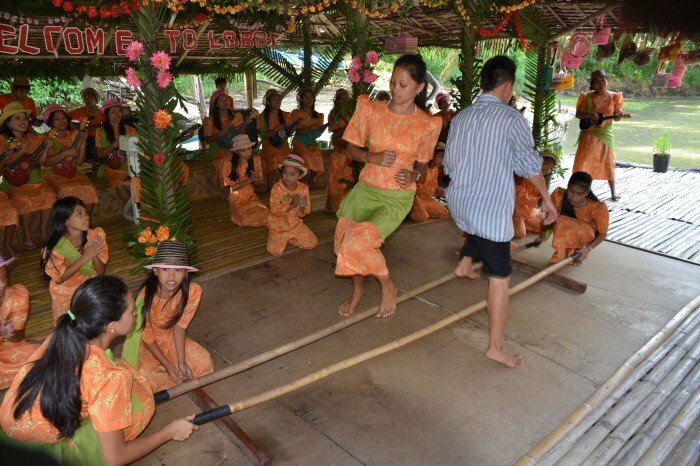 Street parade, colourful costumes, beauty pageants and other local activities are held within the festival month. Bohol’s Roman Catholic churches were established during the early Spanish colonial period. 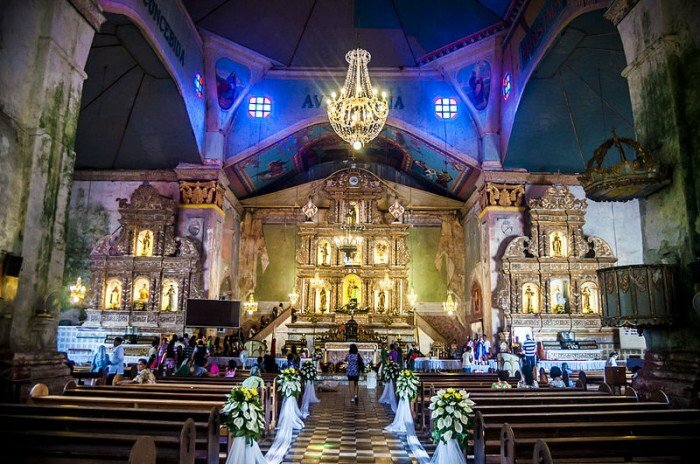 Four of these churches have been declared as National Cultural Treasures for their historical, cultural and architectural importance to the Filipinos. These are Baclayon, Maribojoc, Loon and Loboc. In 2013, a strong earthquake hit Bohol, damaging the centuries-old churches in Baclayon, Dauis, Dimiao, Loay, Loboc, Loon and Maribojo. Majority of these churches were destroyed and reduced to a pile of rubble. To date, some of these churches celebrate holy mass beside the church’s ruins under pitched tents. 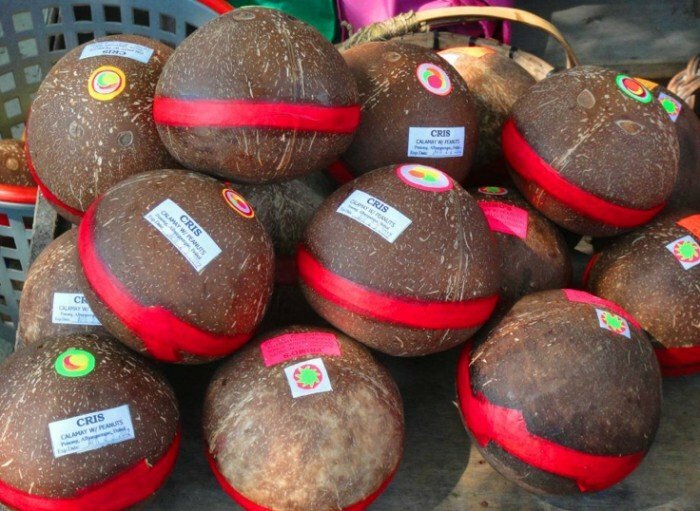 Though calamay—sticky, sweet delicacy made of coconut milk, brown sugar and ground glutinous rice—is found in many regions, Bohol calamay is distinctive for being sold inside coconut shells and sealed with a red band made of crepe paper. Bohol is also known for its large purple yam plantation that grows in the town called Ubay, which prompted the locals to create their own version of purple jam or ube kinampay. Before you leave the island, make sure you take home a box of Peanut Kisses; its shape is reminiscent of the Chocolate Hills. Definitely a sweet treat for you loved ones back home and a testament that you’ve been to Bohol. It is said that the people of Bohol are descendants of the last group of inhabitants who settled in the Philippines called pintados or “tattooed ones’’. 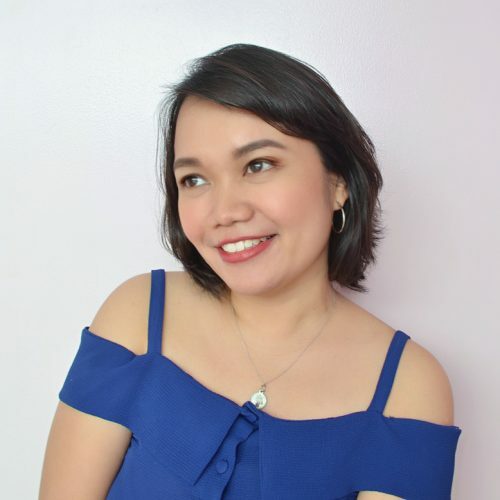 Though Boholanos speak the same dialect as the people in Visayas, they can be distinguished by a few phonetic changes such as their “y” sound that becomes “j” (an example is “iya” in Cebuano becomes “ija”). Then there’s the “k” sound which becomes “h” (example “ako” in Cebuano becomes “aho”). Boholanos are known to be law-abiding citizens, humble, hospitable and religious. It is said that during fiestas, if you happen to pass by a neighbour’s house, you will be welcomed with open arms. Not literally though, but doors are open to any visitor. It is the way locals are brought up. Despite the tragedy that happened in 2013, the Boholanos continue to strive hard to bring back the island’s former pre-earthquake glory. It did not stop them from celebrating fiestas, promoting tourism or lending a hand to their neighbours in times of need. Boholanos are also proud of the Loboc Children’s Choir. They consider the choir as a cultural treasure. Their bragging rights? They won the National Champion in the category of Children’s Choirs during the National Music Competitions for Young Artists in 2001. With their angelic voices that seem to reach deep within our souls, it is no surprise that these kids have come a long way, touching lives with their beautiful voices as they sing all over the country and tour around the world, at the same time bringing pride and joy to Bohol. Now you tell me, aren’t these reasons enough to make you pack your bags and go to Bohol?